Remember those poufs I used to make the giant knit pumpkins? 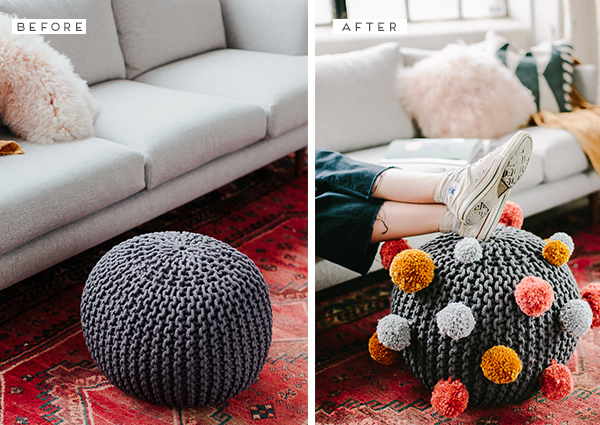 Well, they’ve been just sitting around the studio ever since and I wanted to put them to good use, so I made a DIY pom pom ottoman in fall colors to add something a little more playful to the seating area. This project would be so cute for a kids room, but honestly, I also like it for adults. Adds a little personality, right? Click through to learn how to make your own. 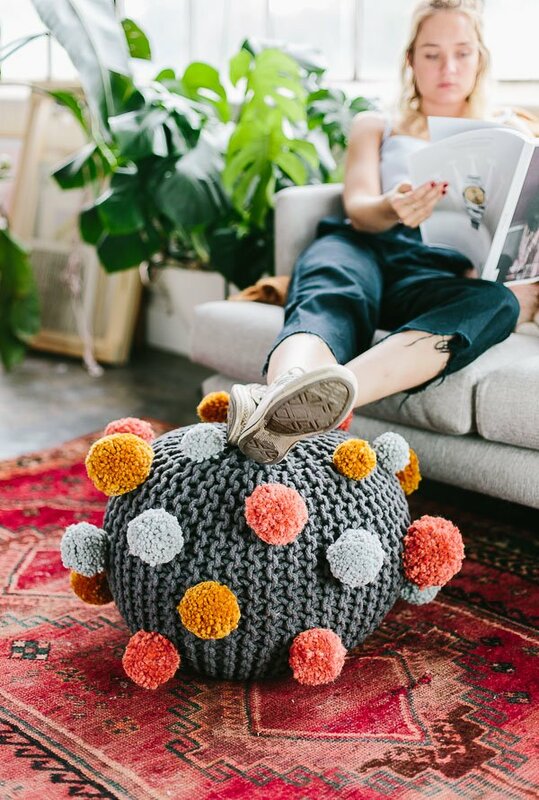 Some of the pom poms that were attached for this pouf DIY were already made (remember the campfire craft night? ), but we also made a few more too so I could show you how to do it. First, you’ll make the pom poms. 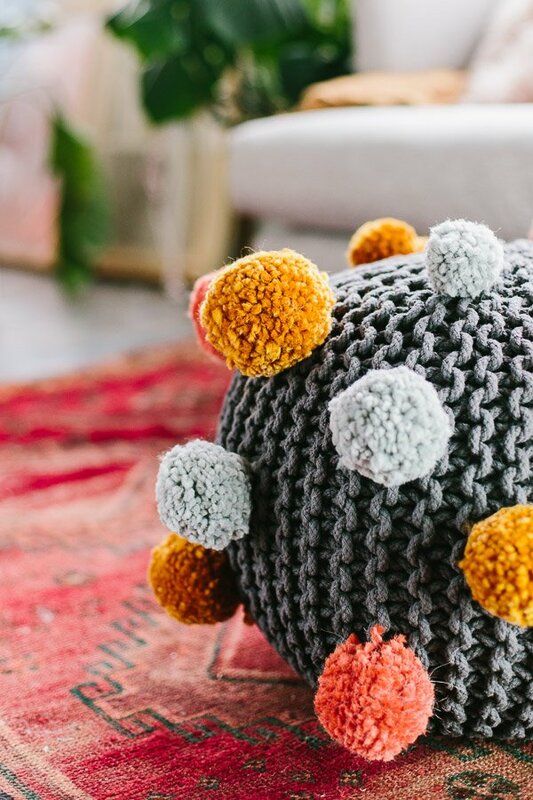 I detailed the step by step process for making pom poms here: campfire craft night (scroll to the pom pom hat photo and you’ll see it). But it’s really easy with a pom pom maker and they come in lots of different sizes. I ordered a set of 4 sizes on Amazon for $13. When you get to the part after cutting all the way around the pom poms but before cutting the string that goes around the inner groove to tie them all together…. 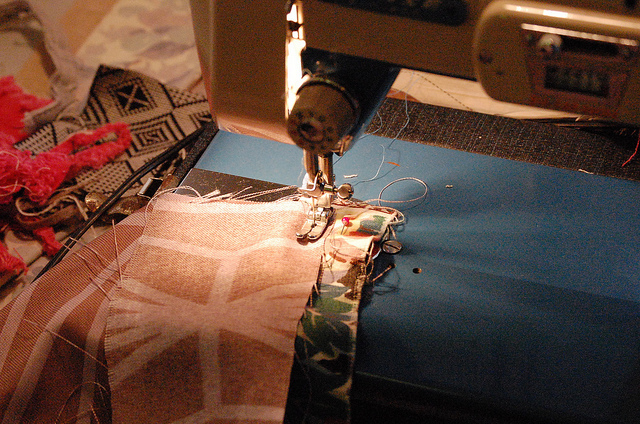 be sure to cut a long piece of string or yarn. 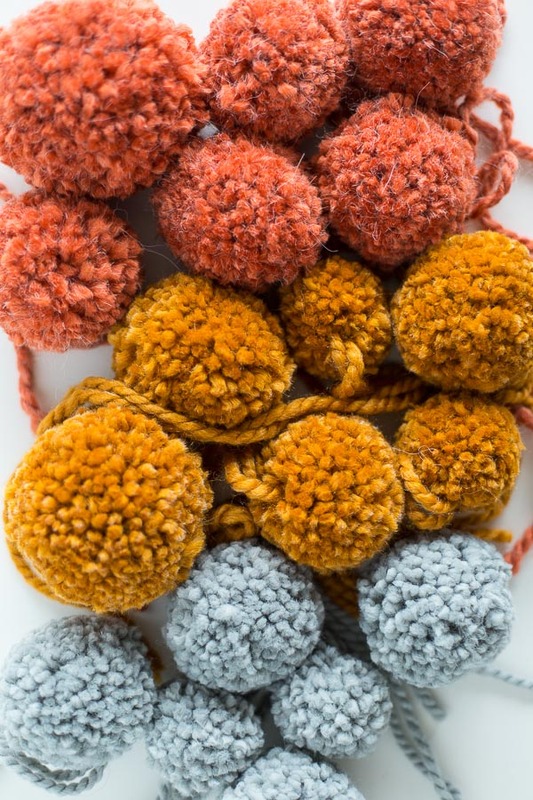 You want extra so that you can easily attach the finished pom poms to the knit pouf. As shown in photo. Then, tie the yarn or string tight and triple knot it. Remove the pom pom maker wings to reveal your pom pom. And trim uneven edges if needed. 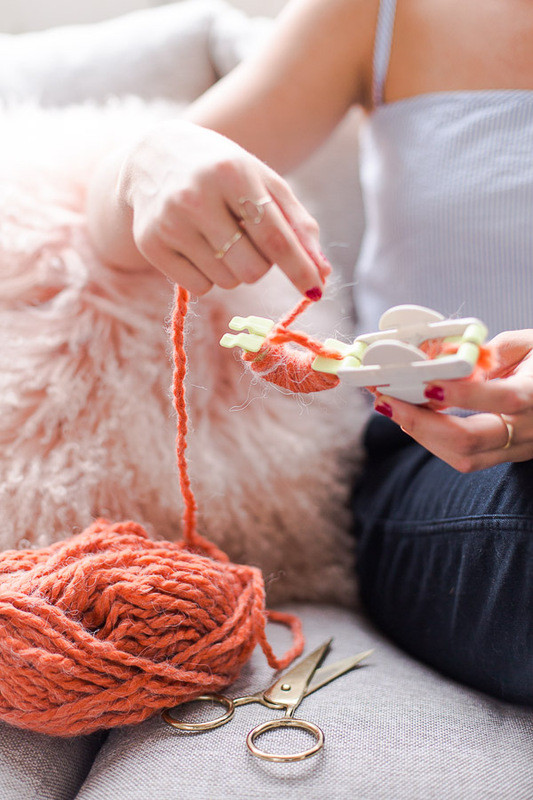 Next, using the long bits of string or yarn that are attached to every pom pom, thread one end through one of the knit loops on the pouf and triple knot it with the other piece of attached pom pom yarn. 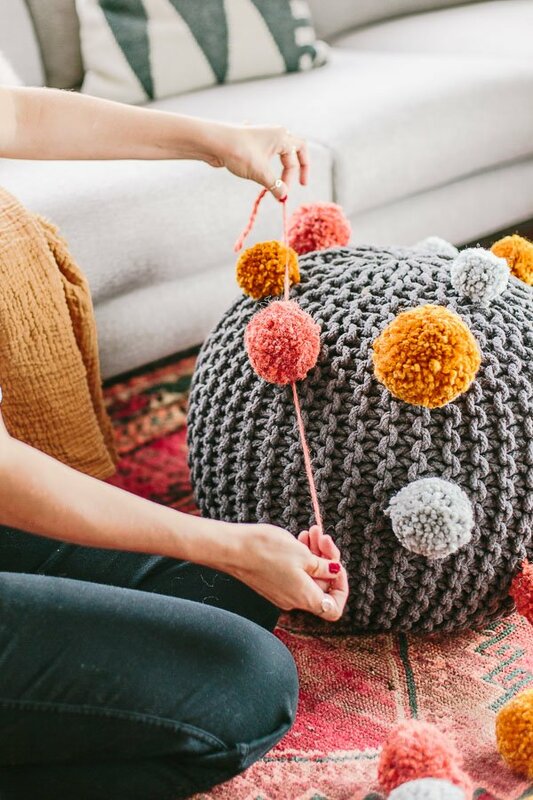 Cut off excess yarn and repeat until the ottoman is all filled up with pom poms. I wouldn’t recommend putting any poms on the very top of the ottoman, that way you can still sit on it easily or rest your feet, etc. 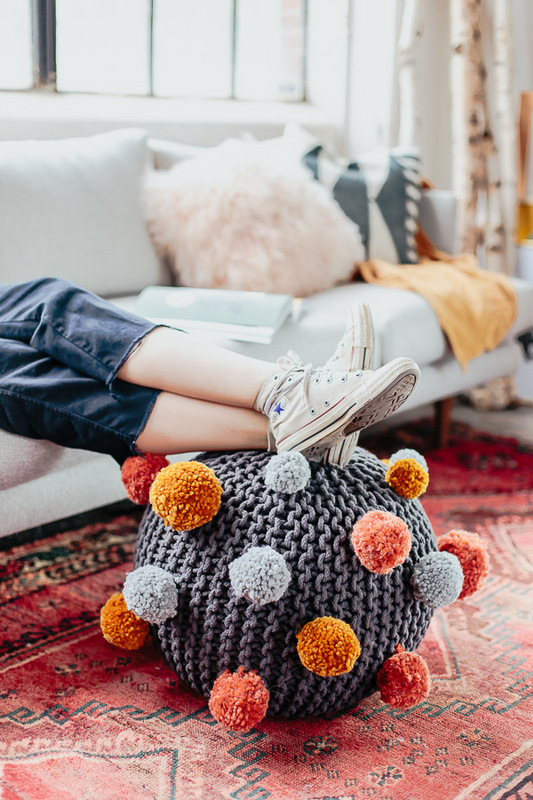 What do you think of this DIY pom pom ottoman? 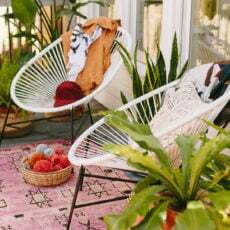 Is it too quirky or just right?! That pom pom ball is really cute! I love it. Thanks Courtney. It’s a quirky one, but I like it too. This is so cute with a modern twist! I think my dog would attack it – it looks so much fun!!! Gorgeous, simple and heaps of fun! What a fun little project, and it looks so cool! 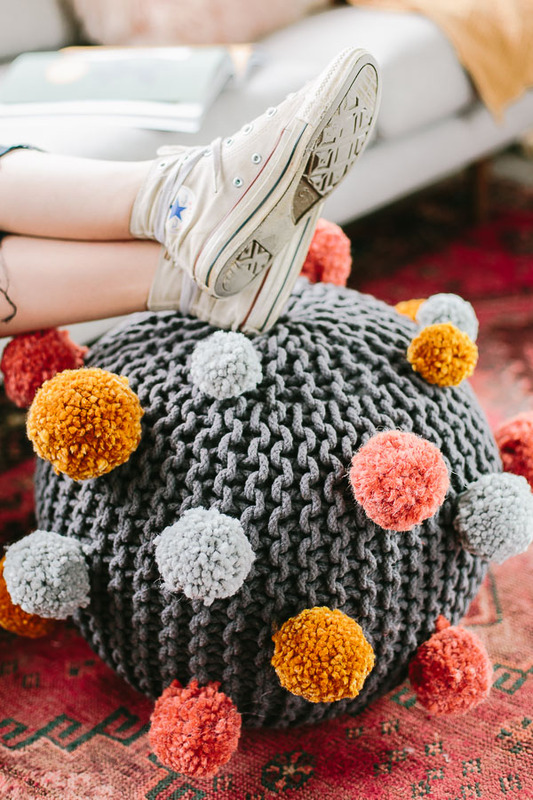 I just love this pom-pom DIY ottoman. It’s looking beautiful. Thanks for sharing this post. well that looks like a fun holiday piece to add to the living room!